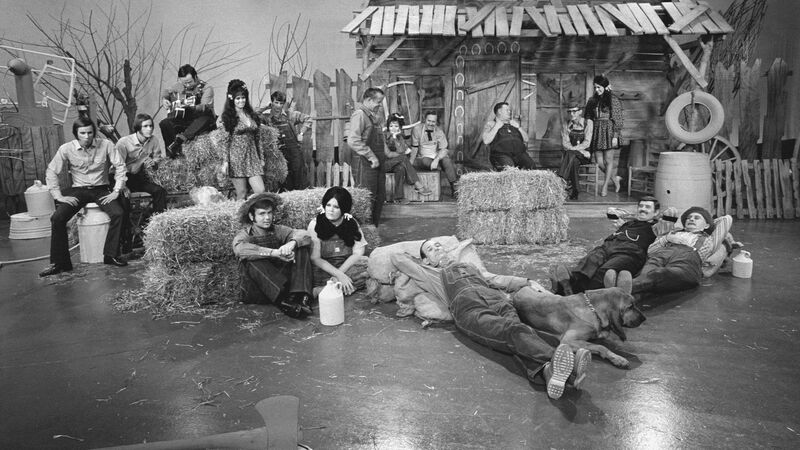 Here's where to watch every episode of Hee Haw season 1. Mouseover or tap an episode to see where to stream it. Click or tap the play icon to stream it on the best available service. Loretta Lynn and Charley Pride Jun 15, 1969 Music:Charley Pride - "Kaw-Liga. "Charley Pride - "I Can't Help It (If I'm Still in Love with You). "Loretta Lynn - "Your Squaw's on the Warpath. "Buck Owens - "Who's Gonna Mow Your Grass? "Roy Clark - "Sally Was a Good Old Girl. "Sheb Wooley - "Flying Time. "Grandpa Jones - "The Banjo Am The Instrument For Me. "The Hagers - "Six Days on the Road." Merle Haggard, Jack Burns Jun 22, 1969 Buck Owens, Don Rich, Susan Raye and the Hagers - "But You Know I Love You" Merle Haggard - "Mama Tried" The Hagers - "With Lonely" Roy Clark - "Yesterday When I Was Young" Merle Haggard - "Branded Man" Buck Owens and the Buckaroos - "Happy Times" Susan Raye - "Just Enough to Keep Me Hanging On" Grandpa Jones - "Mountain Dew"
Tammy Wynette, George Jones and Faron Young Jun 29, 1969 AIRED: 6/29/69Music: Buck Owens and the Buckaroos - "Love's Gonna Live Here" Grandpa Jones - "Night Train to Memphis" (includes a broken banjo string blooper) Tammy Wynette - "Stand by Your Man" George Jones - "White Lightning" Roy Clark - "Caravan" Faron Young - "She Went a Little Bit Farther" Buck Owens and the Buckaroos - "It Takes People Like You" George Jones - "Walk Through This World with Me" Tammy Wynette - "Take Me to Your World" Faron Young - "Wind Me up"Sketches include several installments of "The Cornfield", "The Culhanes", "Samuel B. Sternwheeler", "Gordie's General Store", "KORN News", "Moonshiners", and "Pfft, You Was Gone. Also, "Archie's Barbershop", "Pickin' and Grinnin'", "Hey Grandpa, What's for Supper? ", and stories by Junior Samples and Grandpa Jones. Sonny James, Waylon Jennings, Connie Smith Jul 6, 1969 Sonny James - "Midnight Mood" and "Running Bear." Waylon Jennings - "Only Daddy" and "Lonely Weekends." Connie Smith - "Cry, Cry, Cry" and "Ribbon of Darkness." Buck Owens - "Crying Time" and "Sam's Place." Roy Clark - "Overdue Blues." Merle Haggard, Bonnie Owens, Eddie Fukano Jul 20, 1969 Roy Clark - "She Taught Me How to Yodel" (clips throughout the episode) Buck Owens - "Act Naturally" Merle Haggard - "Hobo Meditations" Eddie Fukano - "To Get Me Off Your Mind" Bonnie Owens - "Lead Me On" Roy Clark - "You Tried to Ruin My Name" Grandpa Jones - "Old Joe Clark" Buck Owens and Susan Raye - "Somewhere Between" Merle Haggard - "Today I Started Loving You Again" Eddie Fukano - "Columbus Stockade Blues" Sketches include several installments of "The Culhanes", "Pfft, You Was Gone", and "KORN News." Also, "Gordie's General Store", "Hey Grandpa, What's for Supper? ", "Pickin' and Grinnin'", Grandpa Jones tells stories about his athletic brother and eating out at a restaurant, Junior Samples tells a story about his squirrel dog, and in "Archie's Barbershop", Archie tells the story of the Pee Little Thrigs. Merle Haggard and Tammy Wynette Dec 17, 1969 Buck Owens, Don Rich, the Hagers, and Diana Scott - "Gonna Roll Out the Red Carpet" The Hagers - "Gotta Get to Oklahoma" Tammy Wynette - "The Ways to Love a Man" Roy Clark - "Overdue Blues" Merle Haggard - "Okie from Muskogee" Tammy Wynette - "The 12th of Never" Buck Owens, Don Rich, the Hagers, and Susan Raye - "Big in Vegas"
Dottie West and Hank Williams Jr. Dec 31, 1969 Music: Buck Owens - "Let the Good Times Roll" Grandpa and Ramona Jones (using bells) - "My Bonnie Lies Over the Ocean" The Hagers - "Lodi" Dottie West - "Clinging to My Baby's Hand" Roy Clark - "Yesterday When I Was Young" Hank Williams Jr. - "Cajun Baby" Dottie West - "Silver Threads and Golden Needles" Hank Williams Jr. - "I'd Rather Be Gone" Buck Owens - "Charlie Brown"Sketches include several installments of "Pfft, You Was Gone", "The Culhanes", "Gordie's General Store", "Dr. Campbell", "KORN News" and "Hee Haw Amateur Minute". Also, "Hee Haw Players", "Archie's Barbershop", "Hey Grandpa, What's for Supper? ", "Pickin' and Grinnin'", Junior Samples tells a story, Grandpa Jones tells a story about his uncle Dan, and Stringbean reads a letter from home. Merle Haggard, Loretta Lynn Jan 28, 1970 Buck Owens performing "We Were Made For Each Other" Merle Haggard performing "I Take A Lot of Pride In What I Am" Hagers performing "Six-Days On The Road" Loretta Lynn performing "First City" Roy Clark performing "Meet Mister Callaghan" Merle Haggard performing "Today I Started Loving You Again" Loretta Lynn performing "Dear Uncle Sam" Buck Owens and Susan Raye performing "Love Is Strange"
Loretta Lynn, Charlie Pride Feb 25, 1970 Loretta Lynn - "To Make a Man." Loretta Lynn - "Wings Upon Your Horn." Charley Pride - "I'm So Afraid of Losing You Again." Charley Pride - "Anybody Going to San Antone." Roy Clark - "Foggy Mountain Breakdown." Buck Owens - "Kansas City Song." Grandpa and Ramona Jones - "You Are My Sunshine. Merle Haggard, Linda Ronstadt Apr 1, 1970 Buck Owens - "My Heart Skips a Beat" Linda Ronstadt - "Are My Thoughts with You?" Merle Haggard - "Every Fool Has a Rainbow" The Hagers - "Your Tender Loving Care" Roy Clark - "Maria Elena" Merle Haggard - "Jimmie's Texas Blues" Grandpa Jones - "Melinda" Buck Owens and Susan Raye- "Togetherness"Sketches include several installments of "The Cornfield", "Dr. Campbell", "Moonshiners", "Hee Haw Amateur Minute", "KORN News", and "Samuel B. Sternwheeler". Also, "Dear Royella", "Hee Haw Players", "Archie's Barbershop", "Gordie's General Store", "Hey Grandpa, What's for Supper? ", "Pfft, You Was Gone", "Pickin' and Grinnin'" and Stringbean reads a letter from home.